December is all about parties with family and friends, and these little guys will have your friends talking at your next party. In Brazil we make these with ground meat. I have had a ham and cheese croquette before too. I went ahead and gave these a whirl with my own little twist of using half aged cheddar, gruyere cheese and adding some spinach to the mix. Trying to convince myself that by adding spinach into it would give it a little bit of nutrition. I love hot sauce so I just drizzled some sriracha on the dish for dipping. I hope you enjoy this little treat. In a medium sauce pan over medium heat, place butter and olive oil in pan & let melt for about 2 minutes. Next whisk flour in with butter and olive oil. Making it into a paste. Then slowly start to add the milk, whisk until there are no lumps and smooth. Season with salt, pepper, nutmeg and paprika. Next add cheese and whisk then add ham and spinach. Whisking everything together. Place the mixture on a large flat plate or baking sheet and cool for about 1 to 2 hours. After an hour or 2. Take out the mixture from the refrigerator and begin to form little balls about the size of a golf ball. Then place them in the flour, beaten egg and then panko. Place each ball to the side until they are all done. Previous Post Gennaro’s Tomato Pie in South Philly!! 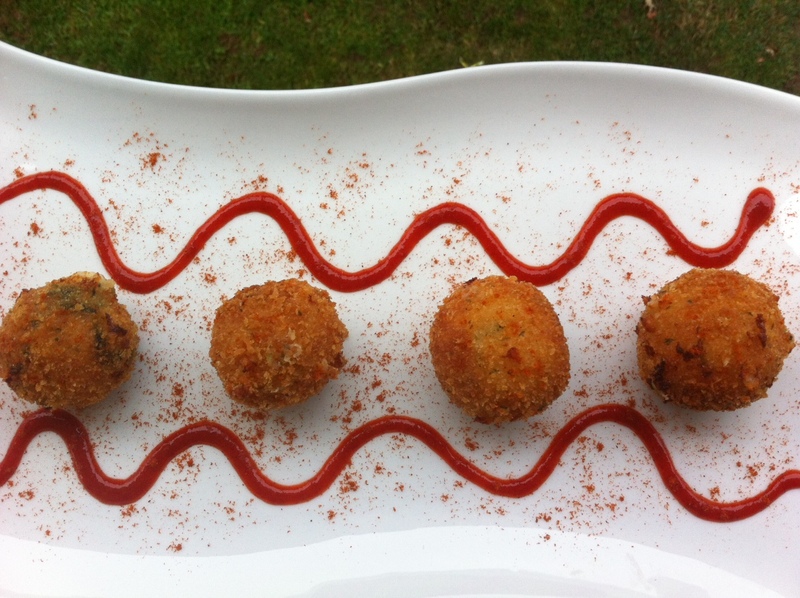 Mmm, croquetas, the perfect party food- and with a little spinach a little healthy! Thanks for sharing! Croquettes are my favorite all-time finger food. These look delicious!